My Thanksgiving started with deadly silence. I had no phone, cable TV & Internet Service. b/c some selfish idiots just decided to cut the fibers and ruin thousands of people’s holidays. from last night to noon, we didn’t have any services. Now Spectrum is offering $50K reward for any information that leads to an arrest. This has been happening so often since Sept., the service outage often lasts more than 15 hours. I wish whoever did this gets a “life in prison” sentence, this person has nor morals, I think he does not deserve to live, he puts many people’s lives in danger when all the services are cut. Especially these sick & weak people… no to mention many companies such as online stores lose their businesses. 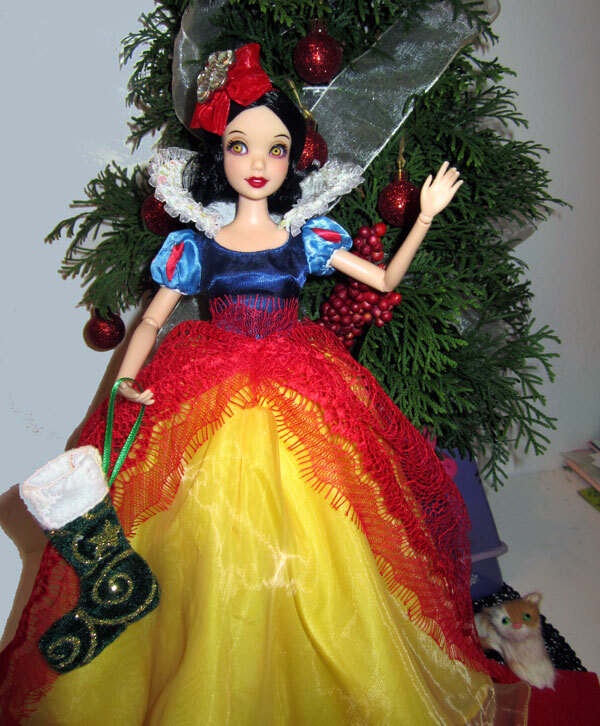 Dinner at Eight, Her Royal Highness Princess Snow White is your hostess. Sorry, the Turkey is overcooked.. The doll has the same size as Mattel’s Skipper doll. Her knees are not jointed, arms & wrists are. The box does not say which company manufactured her, its neither Mattel nor Hasbro. I added a little touch-up on her face. sorry, the tree behind her can win “the Worst Xmas Tree Contest”.